EW DELHI: HMD has not yet confirmed whether it will launch Nokia 9 or not but more evidence of handset’s existence have started popping up. This time the device’s render video has been put up by one of the tipsters on Twitter. 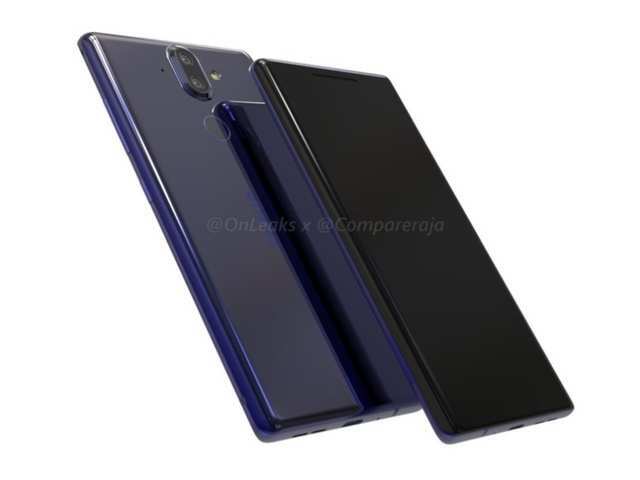 Based on the video by @Onleaks, Nokia 9 will be sporting a dual rear camera much like the Nokia 8 but in a completely different design setup. The smartphone is seen with a small capsule rear camera design instead of an elongated one. The LED flash is placed outside the capsule towards the right side. In addition, the fingerprint sensor is seen placed at the back below the rear camera. At the front, the Nokia 9 is seen with dual curved screens, which take up the entire sides. We are not yet sure if the OS will be able to properly utilise them. What might come as a disappointment for Nokia fans is the handset’s rear camera bump. At the bottom you get a USB Type-C port, which is the only port seen in the handset. This means HMD too will be ditching the 3.5mm headphone jack with the Nokia 9. In terms of specifications, CompareRaja website, which shared the render video, says that the device will probably come with 5.5-inch QHD resolution screen and may be powered by a Snapdragon 835 processor. It will also sport 4GB RAM and may come with 64GB/128GB inbuilt storage. The entire package will measure 140.9×72.9×7.5mm. We are yet to see when the handset sees the light of the day. HMD will be making the Nokia 8 available in India from Saturday. Priced at Rs 35,999, the device will come in Polished Blue, Tempered Blue and Steel colour variants. The smartphone will be exclusively available on Amazon and offline retail stores, including Croma, Reliance, Sangeetha Mobiles, Poorvika and BigC.